JACKSON HOLE, WY-- Nationwide private jet charter leader New Flight Charters reports 2014 trends in private flight activity, aircraft selection and charter booking. Average charter spending in 2014 increased 15.0% over 2013, from an overall average $14,841 per charter to $17,068. The average includes all charter activity and aircraft types, from piston aircraft through heavy and long-range private jets. The increase is due in large part to a movement in charter demand in 2014 from smaller aircraft to larger -- namely into midsize and heavy jets. Midsize jet activity increased 18.8% year over year, and heavy jet activity nearly doubled for New Flight Charters. Meanwhile light jet and turboprop charters declined by 9.8% and 26.1% respectively. As a percent of total, midsize jet charters climbed from 15.6% to 20.5% year over year, and heavy jets jumped from 4.3% to 8.2% of all charters. Light jets however descended from 40.8% to 38.8% in 2014, and turboprops slowed from 23.4% to 18.6% of all charters for the year. New Flight Charters' results mirror TraqPak data released by aviation services company Argus, which reported Part-135 flight activity gains over 2013, including an increase in large-cabin and midsize jet flying, while turboprop flying finished the year down. The overall most popular aircraft chosen in 2014 was the light jet Citation 510/550/560 series, at 36.4% of light jets and 14.5% of all charters, followed by the Hawker 400XP light jet at 19.0% of light jets and 7.6% of all charters. Segmenting further, the midsize jet category featured the Hawker 800A/800XP as by far the most popular at 42.1% of all midsize jet charters and 8.7% of all charters. In heavy jets, the Bombardier Challenger series 300/601/604 was the heavy favorite, at 37% of the category. Data is actual results from more than 750 U.S. domestic and international charter flights paid and flown in 2014, arranged by New Flight Charters. Data is not from online searches, inquiries or projections. Charter fliers choose their aircraft and quote from the several best available for their flight, with no obligation or incentive to choose one or any. New Flight Charters employs aviation data company FlightList Pro to access the entire charter market without restriction. 2014 results, including the trends to larger jets and spending, is only from actual client demand and aircraft choice. Many factors influence the decision for a particular aircraft size and model, such as trip itinerary, flight leg lengths and passenger count. Celebrating its 11th anniversary in 2015 and named to the Inc. 500 fastest growing list four consecutive years, Jackson Hole-based New Flight Charters arranges private domestic and international flights with top-rated operator aircraft at leading jet charter rates, along with its Best Price Guarantee and a perfect safety history. The acclaimed six-member management team features a cumulative 38 years in private jet charter, 44 years FAA-certified experience, 94 years executive management experience, 17,400 hours pilot-in-command, and includes private and commercial pilots and retired law enforcement. Client and industry reviews are available on the New Flight Charters website. The company serves a wide variety of clientele including Fortune 500 companies, government heads of state, presidential campaigns, entertainment icons, private families and entrepreneurs. 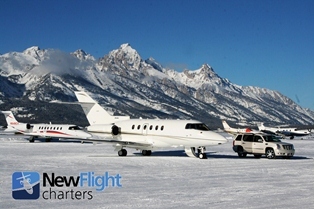 For the latest updates and information, call (800) 732-1653 or visit NewFlightCharters.com.